Halloween Decorations for Grownups - Susan Said... WHAT?! When my children were small, I went a bit crazy decorating for every holiday. And, none more so than my kids’ perennial fave… Halloween! 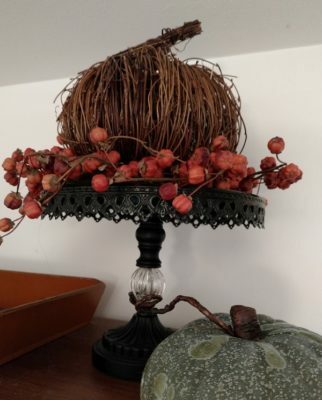 Bats dangled from the chandeliers, jack-o-lanterns leered from every corner, and faux skulls, spiders and all manner of creepy crawlies often surprised the unwary. An abundance of Halloween decorations could be found in every room of the house, even the bathrooms. Now that my kids are grown, I have updated – and upgraded – my Halloween decorations. Although (according to my long-suffering husband) I still go over-the-top, the pieces I favor these days are a little more sophisticated. Start at the front door. Adding a holiday-neutral fall foliage wreath creates a welcoming entrance andcan be kept up until it’s time to decorate for Christmas. Shop your home. You never know what could be repurposed. For example, I rediscovered several sturdy vintage wooden wine crates in my basement. Stacked, they flank my front entranceway and offer great display space for harvest bounty of pumpkins and potted mums. I also found a black cake stand which I don’t often use, since it’s not quite level. Not so great for cakes… perfect for a faux pumpkin! Replace your candles… with black ones.Masses of mismatched crystal candlesticks filled with black candles on a mantle or dining table offer a sophisticated, yet completely creepy Halloween vibe. Mini pumpkins and gourds. Real versions are available everywhere from the grocery store to farm market stands. Incredibly realistic faux versions can be found in your local craft store and sometimes even the Dollar Store. 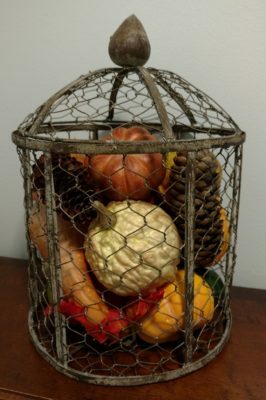 If you are pressed for time, simply load up on a variety of colorful, attractive mini pumpkins and gourds. Use them to replace the candles in your candlesticks, stuff lanterns, fill crystal or wooden bowls, perch a row on a windowsill, and you’re done! Fresh flowers. The season offers so many gorgeous options. And, stores discount such as Trader Joe’s make fresh flowers more affordable that they have been in years. Simply plunk an arrangement in an existing vase. If time allows, hollow out a pumpkin (real or faux), add a clear glass of water, and you have an Instagram-worthy centerpiece. Metallic accents. Whether you favor silver or gold, metallic accents create glam Halloween decortions. 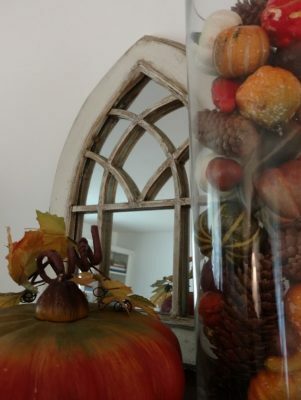 Simply spray real or faux pumpkins for a rich look. Metallic is best when massed, so a stack of pumpkins in gleaming gold will make a bigger impact than those same pieces scattered throughout the home. Inexpensive tag sale glass pieces can also be turned into “mercury glass” simply by using spray paint. My favorite is Krylon Looking Glass Spray Paint. Have you got some favorite Halloween decorations? Or, easy-to-implement decorating tips? Please share them in the comments section, below! Done with your Halloween decorations? 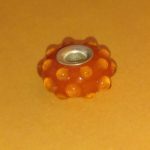 You’re just in time to win this autumnal Murano glass bead for your charm bead bracelet! The orange “gourd” bead brings to mind the best of the bountiful fall harvest. The bead is handmade by The Velvet Box artisans and features a sterling silver core. This bead is compatible with Pandora, Trollbeads, and Chamilia bracelets and jewelry. Giveaway ends 11-5-2018.